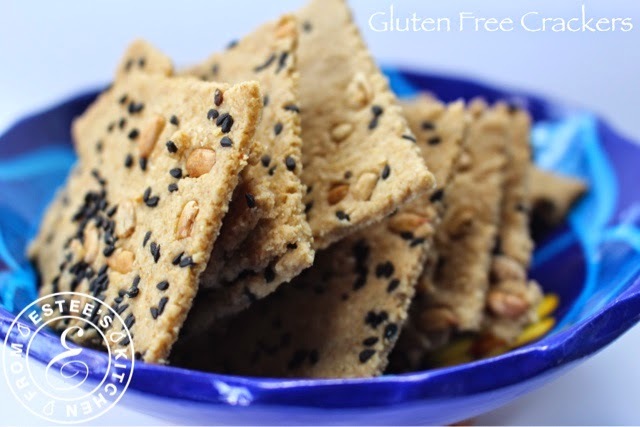 I made these crackers with gluten free whole oat flour, but if you are not allergic to gluten, you can certainly use your favorite flour instead. These gourmet crackers turn out crunchy, flavorful, and elegant. The nigella seeds and the sunflower seeds add so much flavor and are basically what make the crackers. Nigella seeds are also called black cumin seeds, and are known for their endless health benefits! I often end my post with how easy it is to make my dishes, but this recipe is truly a simple one. I am trying to avoid processed food as much as possible. If you read the labels on any bag of crackers you buy at the store, you may not believe how long the list of ingredients is, including harmful preservatives and toxins. When you make your own crackers, you can ensure that you are in control of the amount of sodium and the quality of the ingredients you put into it. Take 2 large baking sheets and line with parchment paper. Take a mixer with the dough hook, add the flour, water, oil, and salt, and work the dough until it is nice and smooth and equally combined. Take a wooden dough roller and dust with some flour. Cut the dough into 2 pieces. Roll each piece directly on the parchment paper, forming a thin, even layer (about 1/8 inch), but not too thin. Sprinkle the nigella seeds and the sunflower seeds and press with the roller into the dough. Take a sharp knife and cut equally sized square crackers, but do not lift them/move them around. Bake for 15-20 minutes. Let cool and enjoy with your favorite spread.